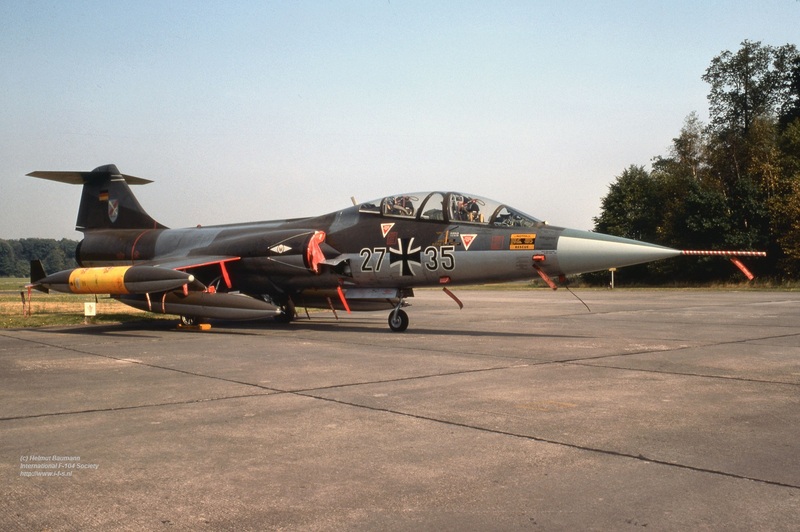 This month a squadron exchange took place between the German Air Force JBG31 based at Norvenich and the Royal Air Force 1 Squadron, based at RAF Wittering, flying the Hawker Harrier GR.3 jet. It was a 2-way exchange. 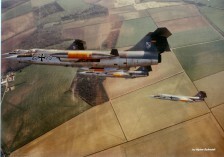 The Germans participated with aircraft 20+56, 22+56, 24+42, 25+75, 27+84 (replaced by 27+35 on 9 May). Aircraft 20+57 and 22+69 visited Wittering 13/14 May during the exchange. Support on monday 5 May was provided by transport aircraft 50+08 and 50+41 both from LTG-63 Hohn. In total six Harriers flew to Germany including one T2 version. Beneath some photos taken during the event. Left the German and British crew. 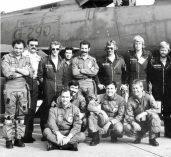 The first German from the left is Olt Aarne Kreuzinger-Janik (later Chief of the Luftwaffe), second is Olt Tietje, in the middle the late Maj “Yogi” Söldner (3813 hours F-104, world record holder), far right is the late Hptm Schmidt (Photo: Heribert Mennen), Second photo (taken by Hptm Schmidt) shows the formation on its way to Wittering. 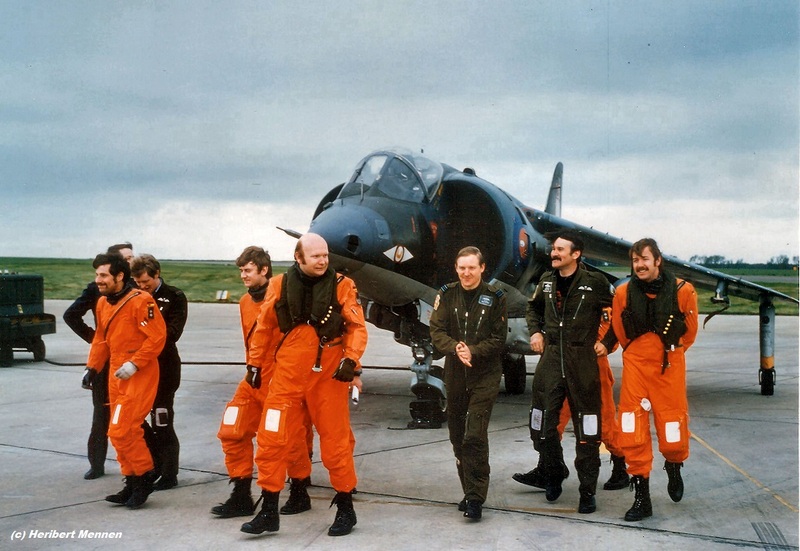 The third photo was taken by the photopod of one of the Harrier aircraft (Photo: RAF 1 Squadron). Finally a photo showing TF-104G 27+35 wearing a 1 Squadron zapp on its intake (taken at Norvenich after the exchange) thanks to Helmut Baumann. 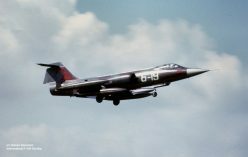 This year a squadron exchange took place between the French Navy 11F, flying the Etendard IV M, based at Landivisiau and the German Navy MFG1, based at Schleswig Jagel flying the F-104G. First the German aircraft flew to France in May and then the French aircraft came to Germany in August. 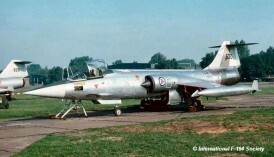 In total 6 Starfighters flew to France. 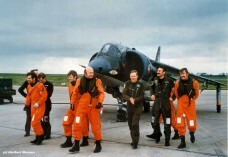 This period a squadron exchange took place between the Dutch Air Force 322 Squadron based at Leeuwarden and the Danish Air Force 723 Eskadrille, based at Aalborg. It was a 2-way exchange. 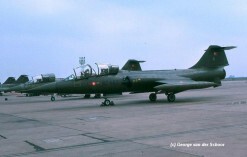 Danish Starfighters seen at Leeuwarden AB were R-347, R-348, R-699, R-645 and R-755. Four Dutch Starfighters flew to Aalborg. 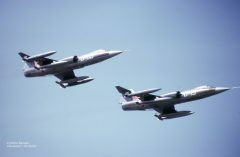 All Danish Starfighters departed on June 4th except R-347 which already left May 28th to be replaced by R-753. The CF-104D RT-657 arrived on June 2nd with danish open sandwiches (smørrebrød) and Snaps for the "farewell" party in the officers mess. This CF-104D also visited Leeuwarden already April 28th to prepare the exchange. Beneath three Danish Starfighters photographed by Gerrit Hiemstra and one by Andries Warring and an other one by Piet Glas. On top from left to right R-347 (May 26th), R-645 and R-755 and below R-347 at the platform on May 26th, RT-657 landing on June 2nd and finally R-699 landing on May 26th. 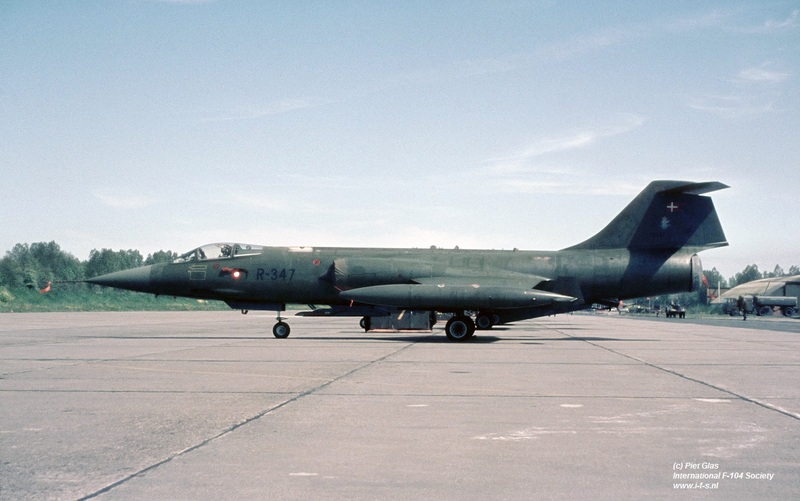 This year a squadron exchange took place between the Royal Air Force 14 Squadron, flying the Phantom FGR.2 at Bruggen, and the Canadian Air Force 441 Squadron based at Sollingen flying the CF-104. It was a shifted 2-way exchange. 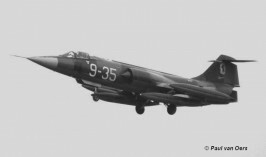 First the Starfighters flew at Bruggen in June and later (between 16th and 24th July) the Phantoms visited Sollingen. Quite some Canadian aircraft were seen during the exchange period. It all started with the arrival of six Starfighters (104735, 104747, 104770, 104824, 104866 and 104661) and two CT-33's (133450 and 133524). 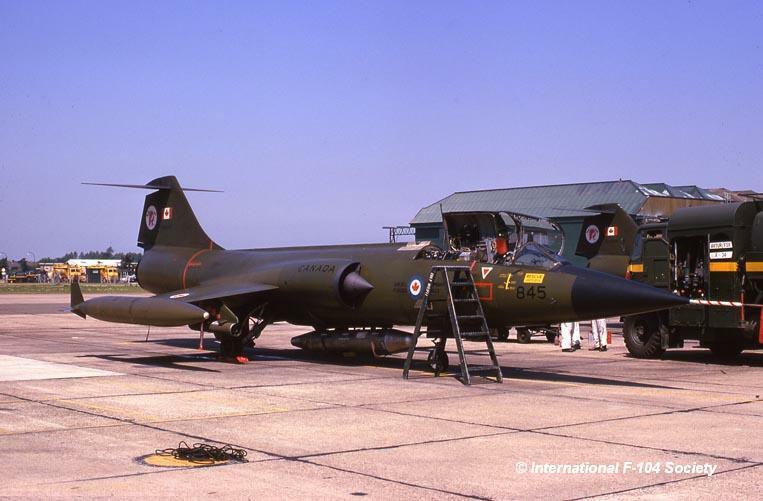 On June 4th, CF-104 104838 arrived and two days later four more Starfighters arrived being 104808, 104822, 104829 and 104653. 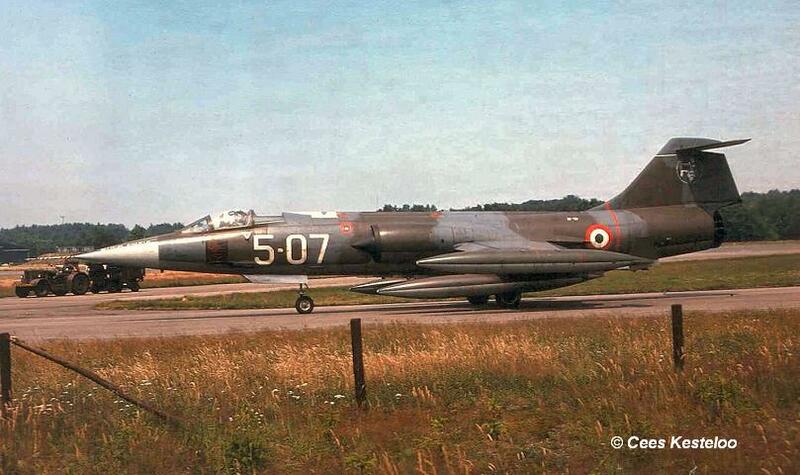 On June 7th the first Starfighters flew back home being 104808, 104822, 104829 and 104653. Finally on June 1oth the last six Starfighters departed Bruggen, 11:30h local time) being 104735, 104770, 104824, 104838, 104866 and 104661. 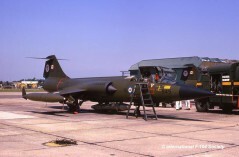 This period a squadron exchange took place between the German Navy MFG2 (1st Staffel) based at Eggebek and the Italian Air Force 28 Gruppo (part of 3 Aerobrigata), based at Villafranca, both flying the RF-104G Starfighter. It was a 2-way exchange. In total 6 German Starfighters flew to Italy and 4 Italian Starfighters flew to Eggebek. The Germans found out that all operational fly worthy Italian aircraft had been flown to Eggebek except one. So most of the times the Germans in Italy had to fly missions on their own. 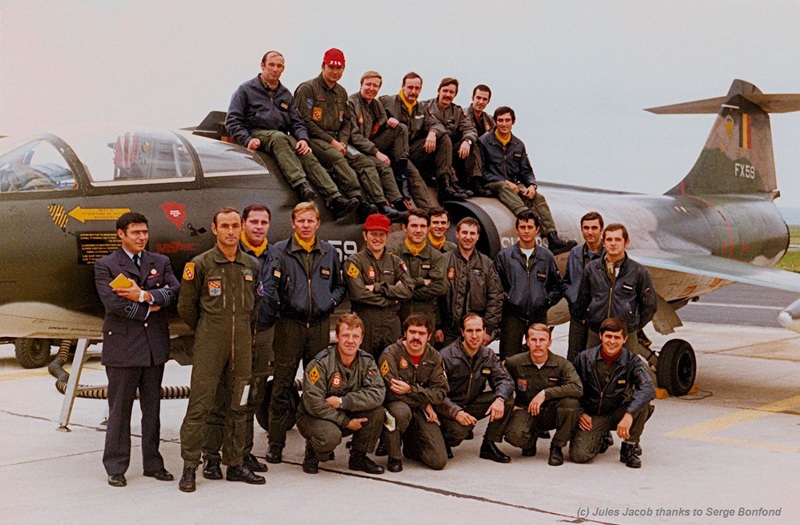 This month a squadron exchange took place between the USAFE 32 TFS at Soesterberg, flying the F-4E Phantom and the Italian Air Force 23 as well as 102 Gruppo, both based at Rimini, flying the F-104S. It is unknown if it was a 1 or 2-way exchange. At least the Italians went to Holland. 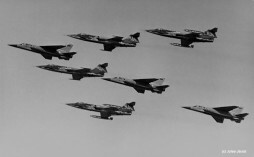 Participating Italian aircraft were MM6810/5-33, MM6822/5-34, MM6833/5-07 and MM6846/5-20. These aircraft were seen at Soesterberg on June 18th. 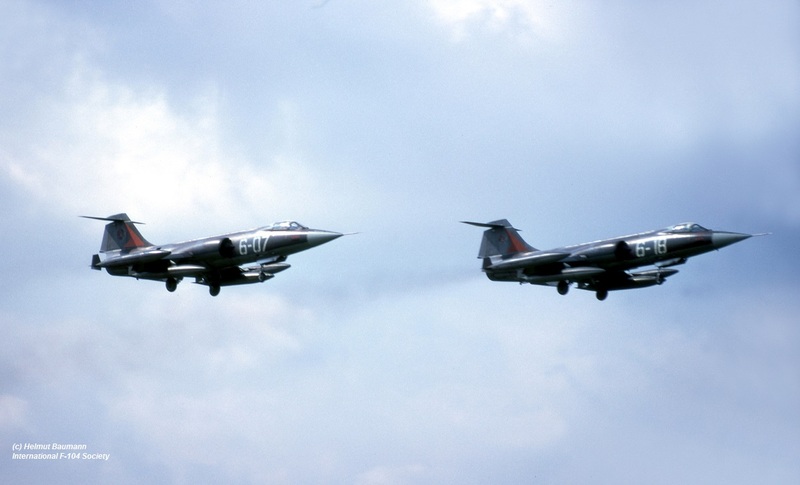 Beneath photos of all the four Starfighters, 5-07, 5-20 and 5-33 on June 18th by Cees Kesteloo and 5-34 by Paul Tips. In June 1975 the 421 Squadron flying the CF-104 Starfighter, based at Baden-Sollingen visited RAF 6 Squadron flying the Jaguar fighter bomber at Coltishall. 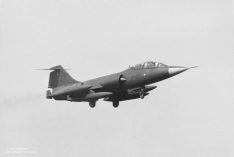 It was a planned shifted two-way exchange, first the CF-104s were flying from Coltishall in June (for eight days) and lateron a visit was planned by Jaguars to Baden Sollingen after or in Autumn 1975, also for 8 days. It is not known if it really took place, although it is almost certain. Aircraft seen at Coltishall all were oliv drab and carried 412 Squadron badges on their rudders and included CF-104 104839 and 104845. 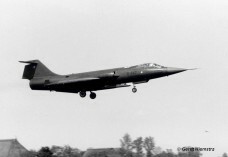 At least the aircraft were seen at Coltishall from 20 till 24 June. Photos beneath show a group photo at Coltishall on June, 20th with a Jaguar and CF-104 104839 (421 Squadron badge on the tail) taken by Herv Wregget, (ex 421 Squadron pilot) and an other photo shows CF-104 104845 at the Coltishall flightline. This month a squadron exchange took place between the Royal Air Force 31 Squadron, operating the Phantom FGR.2 from Bruggen, Germany, and the Italian Air Force 12 Gruppo based at Gioia Del Colle flying the F-104S. 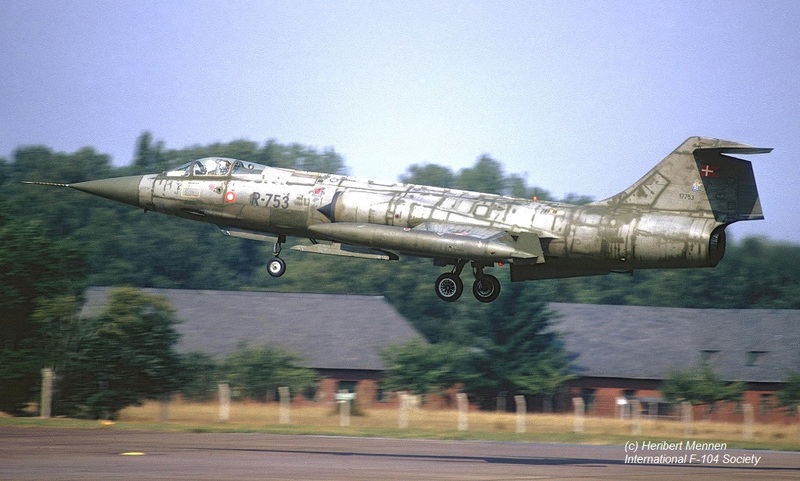 It was a 1-way exchange where only five Starfighters flew to Bruggen : MM6803/36-03, MM6816/36-06, MM6767/36-07, MM6807/36-10 and MM6811/36-11. Aircraft 36-06 and 36-07 already arrived on July 1st. Aircraft 36-11 arrived the 3rd of July. The others arrived the 2nd of July. All aircraft left again on July 9th at 11:00h local time. Support was provided by MM61996 code 46-10 which arrived July 8th, the day before the departure of the squadron. This period around July 25th, the Danish Air Force 727 Eskadrille based at Skrydstrup, flying the F-100D Super Sabre, exchanged with the Italian Air Force 155 Gruppo (51 Stormo) at Istrana flying the F-104S Starfighter. It was a 2 way exchange. Beneath a photo taken at Istrana showing some of the pilots (thanks to Comm. Marcello Conti). 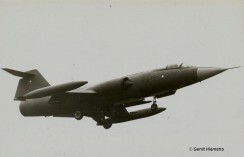 This year a squadron exchange took place between the French Navy 11F, flying the Etendard IV M, based at Landivisiau and the German Navy MFG1, based at Schleswig Jagel flying the F-104G. First the German aircraft flew to France in May and then the French aircraft came to Germany in August.. 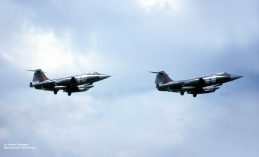 The French flew over to Germany with 6 Etendard fighter jets. 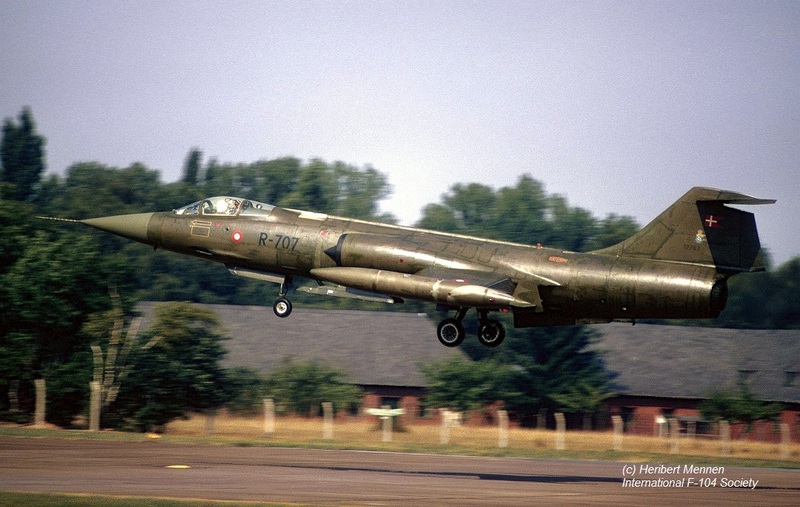 This month a squadron exchange took place between the Dutch Air Force 314 Squadron based at Eindhoven, flying the NF-5A jet and the Italian Air Force 21 Gruppo based at Cameri flying the F-104S. It is unknown if it was a 1 or 2-way exchange but at least the Italians came to Eindhoven AB. 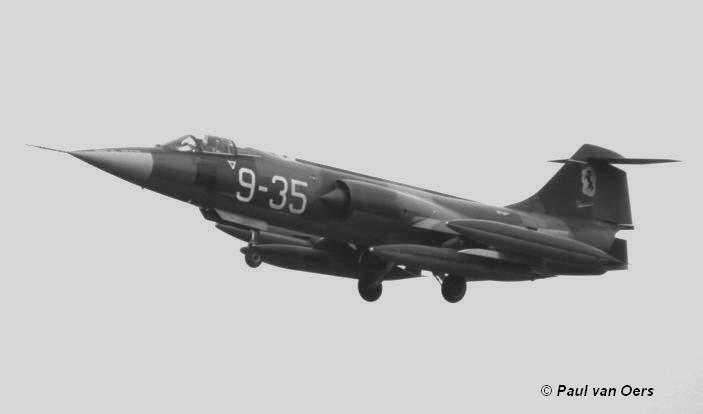 Aircraft seen in Holland were MM6706/53-10, MM6737/53-11, MM6771/53-05. Beneath a photo of 53-05 thanks to Eric Tammer and a photo of 53-10 taxying on August 19th, thanks to Frank Swinkels. 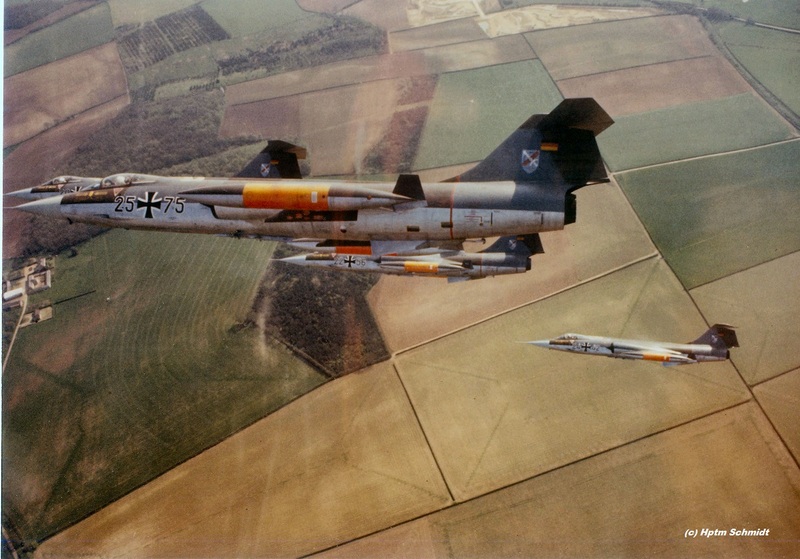 This month a squadron exchange took place between the German Air Force WS10 instruction squadron based at Jever and the Italian Air Force 9 Gruppo based at Grosseto flying the F-104S. It was a 2-way exchange. One of the participating aircraft at Jever AB was aircraft MM6869/4-3 as can be seen beneath taxying at Jever (by M.J. Gerards). 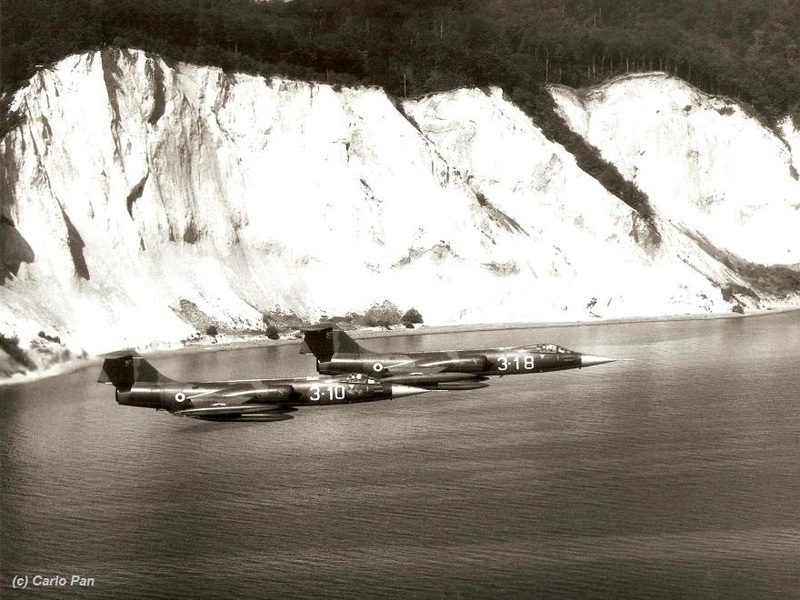 Aircraft seen in Italy were F-104G 20+61, 23+30, 24+43, 24+51 and TF-104G 27+06, 27+74, 28+29, 28+32 (thanks to Daniele Mattiuzzo). Aircraft 27+74, as reported, gives a bit of mystery. It could be that it was on temporary loan from JBG33 due to a shortage on aircraft. 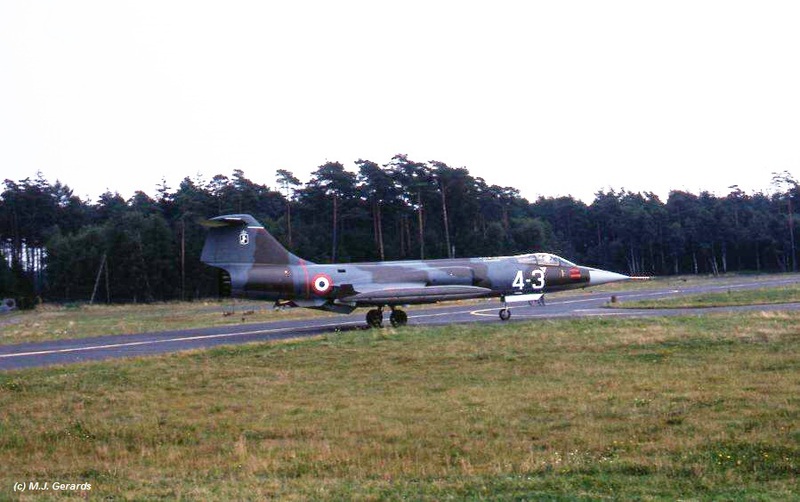 The Belgium Air Force 349 Squadron (1 Wing) based at Beauvechain, flying the F-104G Starfighter, exchanged with USAFE 525 TFS/36 TFW squadron at Bitburg, Germany, operating the F-4E Phantom. It is unknown if the American aircraft flew to Belgium but at least the Belgium F-104s went to Bitburg, including aircraft FX72. Photo beneath shows FX72 cockpit with inside 349 Squadron commander Major D’Hert. 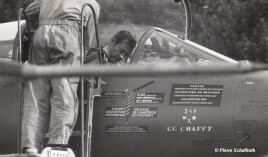 The aircraft was crewchiefed by Pierre Schaffrath (also owner of this photo). This year there was a squadron exchange between the Belgium Air Force 23 Smaldeel (10 Wing), operating the F-104G from Kleine Brogel and French Air Force 11 EC based at Toul-Rosières, flying the F-100D Super Sabre. It was a two way exchange. 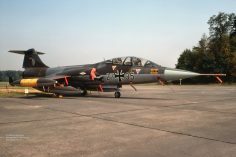 The Belgium Starfighters flew to France and their stay was hosted by EC 2/11 while aircraft from EC 1/11 stayed at Kleine Brogel. 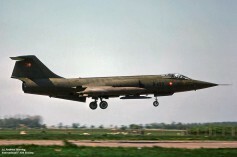 This month a squadron exchange took place between the Dutch Air Force 312 Squadron based at Volkel, flying the F-104G and the Italian Air Force 10 Gruppo based at Grazzanise flying the F-104S. It was a 2-way exchange. Aircraft flying to Volkel AB were MM6808/9-30, MM6809/9-35, MM6812/9-32 and MM6826/9-44. 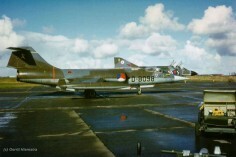 The Dutch Starfighters which flew to Italy were D-6695, D-6699, D-8063, D-8312, D-8343. 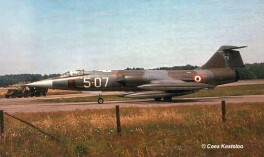 It was told that also TF-104G D-5806 was seen at Grazzanise. 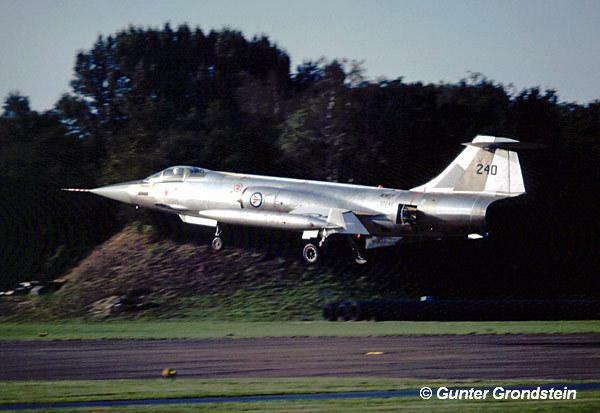 Photo beneath show MM6809 with code 9-35 landing at Volkel taken by Paul van Oers. This period a squadron exchange took place between the Danish Air Force 723 Eskadrille based at Aalborg, flying the F-104 Starfighter and the Royal Air Force 92 Squadron at Gutersloh in Germany flying the Lightning F.2A. 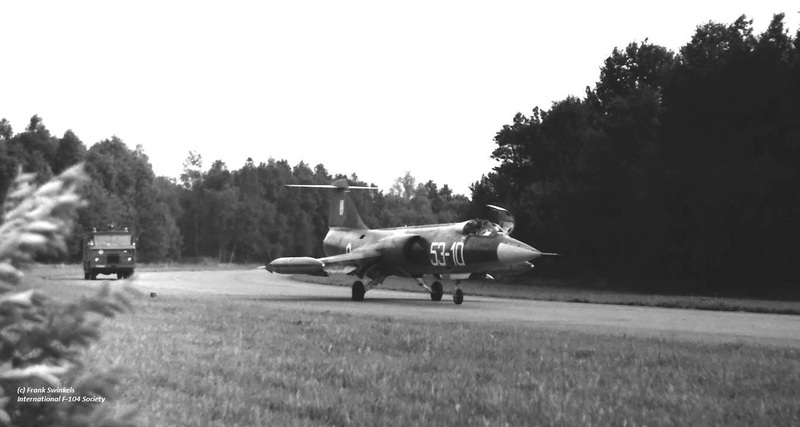 It is unknown if it was a 1 or 2 way exchange but at least the Danish came over with 4 Starfighters : R-347, R-699, R-707 and R-753. Beneath two photos thanks to Heribert Mennen showing R-707 and R-753 landing on the Gutersloh runway. Later this month a squadron exchange took place between the USAFE 22 TFS/36 TFW based at Bitburg, flying the F-4 Phantom and the Italian Air Force 154 Gruppo based at Ghedi flying the F-104G. It is unknown if it was a 1 or 2-way exchange but at least the Italians came to Germany with aircraft MM6508/6-19, MM6516/6-07, MM6523/6-18 and MM6575/6-03. It was a very tragic event since all four Starfighters were lost on their way home on the morning of Thursday September 25th. It was a day with low clouds and the four Italian F-104G’s departed Bitburg AB in two-ships homebound for Ghedi. While trying to follow the SID (which was unsuitable for the aircraft configuration) and simultaneously perform a formation re-join they hit raising terrain at the Wenzelberg (Godendorf, ssw of Bitburg AB). 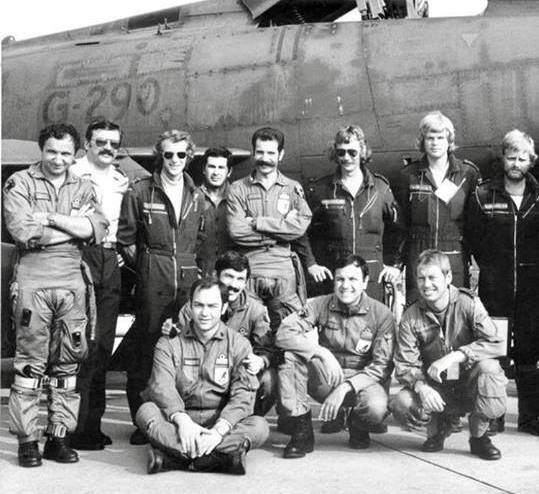 All aircraft were destroyed, the pilots were sadly all killed instantly. The photos beneath were taken by Helmut Baumann at Bitburg showing all partipating Italian aircraft not knowing what will happen to these aircraft lateron when they left for home. This link https://kulturdb.de/einobjekt.php?id=7487 gives information about the monument to honor the 4 Italian pilots and how to reach it at the exact location (near Godendorf). This month a squadron exchange took place between the Norwegian Air Force 331 Skv, based at Bodo and the Royal Air Force 19 Squadron flying the Lightning F.2A, based at Gutersloh. It was a 2-way exchange. 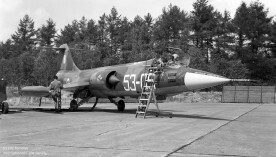 Participating four Norwegian aircraft were 240, 629, 630 and TF-104G 263. Beneath a few photos showing aircraft 240 (by Gunter Grondstein) and 629 and 630 on the Gutersloh platform. This period a squadron exchange took place between the Dutch Air Force 311 Squadron based at Volkel and Danish Air Force 725 Eskadrille flying the A35XD Draken, based at Karup. 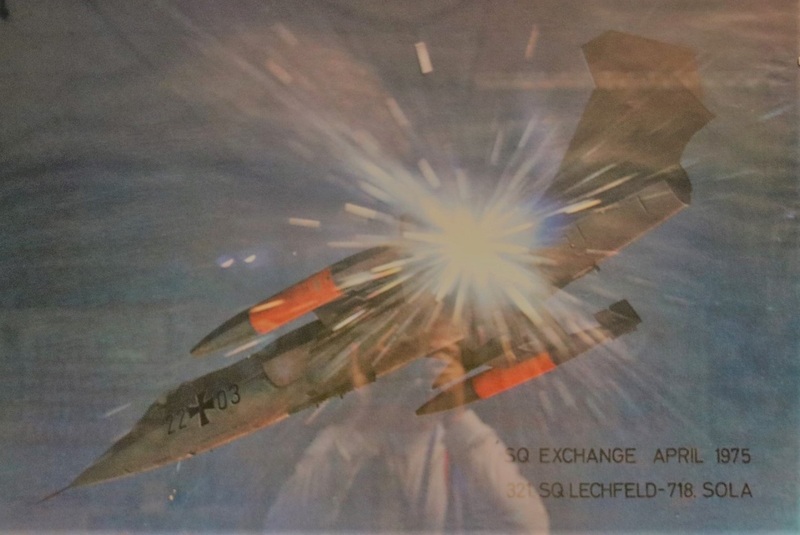 It was a 2-way exchange where 4 Drakens came to Holland and likely also four Starfighters flew to Denmark, but that was already in May 1975, so being a time-shifted exchange. This month the Belgium Air Force 350 Squadron (1 Wing) based at Beauvechain exchanged with EC 3/30 from Reims France flying the Mirage F1C. It was a two-way exchange. 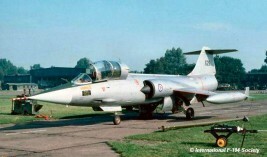 The Belgians flew to France including aircraft FX23. Beneath two photos thanks to Jules Jacob taken at Beauvechain during the exchange. 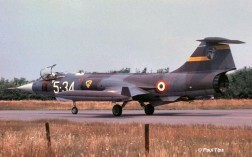 This month a squadron exchange took place between the Dutch Air Force 316 Squadron based at Gilze Rijen, flying the NF-5A and the Italian Air Force 156 Gruppo based at Gioia Del Colle flying the F-104S. 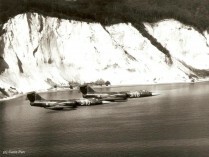 It was a 2-way shifted exchange were 316 Squadron visited Italy already during 18-27 June. 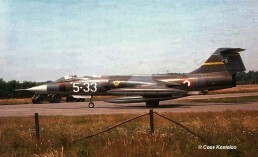 Italian Starfighters seen at Gilze Rijen AB during Autumn were MM6751/36-33, MM6759/36-48, MM6798/36-40 and MM6840/36-35. From the end of September till mid October a squadron exchange took place between the Dutch Air Force 306 Squadron, based at Volkel, flying the RF-104G and the USAFE 38 TRS/26 TRW, based at Zweibrucken, Germany flying the RF-4C Phantom. It was a 2 way shifted exchange where six RF-4C aircraft flew to Holland on September 30th (One of them arrived the 7th of October) and departed again on October 10th. 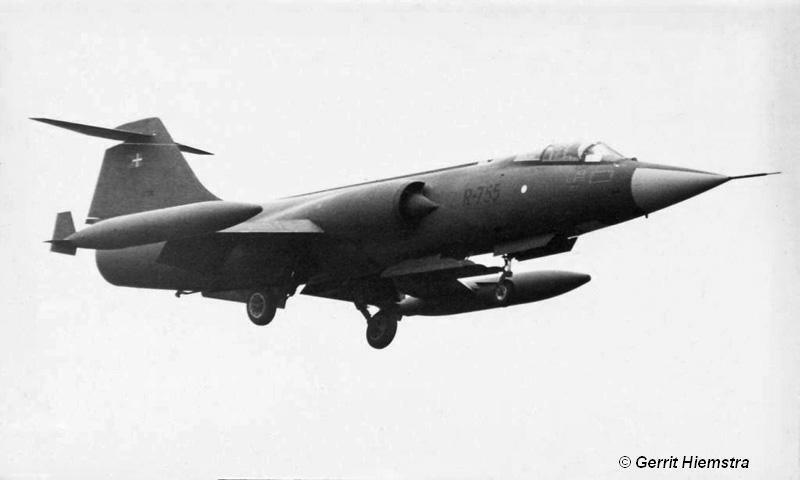 That same day 306 Squadron started their turn and flew to Zweibrucken with four RF-104Gs and one TF-104G. They stayed their till mid October. Transport was flown by a Dutch Air Force F-27 Friendship. This year Danish Air Force 729 Eskadrille based at Karup, flying the Saab Draken, exchanged with the Italian Air Force 18 Gruppo (part of 3 Aerobrigata) at Villafranca. 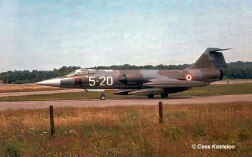 It is unknown if it was a 1 or 2 way exchange but at least the Italians were seen in Denmark including F-104Gs MM6??? code 3-18 and MM6502 code 3-10. The wonderful photo beneath was provided by Carlo Pan and was taken near the island of Moen, taken by a Draken camera.